After its successful landing at Inchon and capture of Seoul in September 1950, the U.S. X Corps was joined by Eighth Army, and many people expected the two commands to be combined into one. Instead, General MacArthur ordered the X Corps to load onto ships and travel around the peninsula to northeastern Korea and the port city of Wonsan, which the South Korean I Corps had captured. Major elements of X Corps were to move west from their positions in northeast Korea and cut the supply lines of Chinese troops expected to cross the Yalu and confront Eighth Army. Other parts of X Corps would push north toward the border and thus control all of Korea. Neither goal was met. 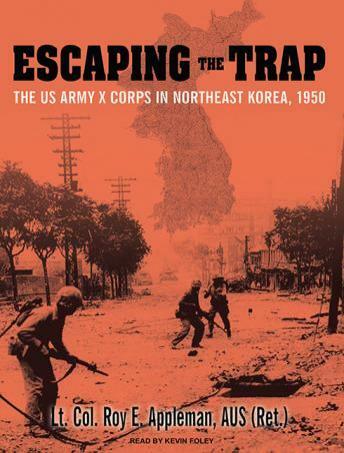 Escaping the Trap tells what happened when X Corps discovered that the Chinese had crossed the Yalu unseen and marched rapidly to Chosin Reservoir, where they landed a surprise attack against the 1st Marine Division and the army's 31st Regimental Combat Team of the 7th Infantry Division. The Chinese attack in late November 1950 virtually annihilated the 31st RCT east of Chosin, while the 1st Marine Division made an escape through treacherous terrain and a forty-mile roadblock, pushing on to the coast and the monumental evacuation of X Corps from North Korea. Roy E. Appleman's study of the day-to-day records of X Corps and of published material and his interviews and correspondence with survivors make the whole story of this portion of the Korean War available for the first time.